Chelsea and Man Utd target Simon Kjaer has responded to speculation linking him with a move to England, and it doesn’t look like it will happen any time soon. The 27-year-old is currently at Fenerbahce having played in various leagues around Europe, and is considered a solid enough defender that could arguably offer depth for either Jose Mourinho or Antonio Conte. With Branislav Ivanovic leaving in January and John Terry likely to retire or move on this summer, Conte will likely need to strengthen his defensive options moving forward. The 47-year-old has enjoyed great success with a three-man defence this season as they look on course to deliver a Premier League title, but particularly with a return to the Champions League next season, he will need depth and more flexibility. Over in Manchester, Mourinho has various options at his disposal already, but the Portuguese tactician continues to be linked with another defender to seemingly play alongside Eric Bailly with the likes of Chris Smalling, Phil Jones and Marcos Rojo in and out of the team. 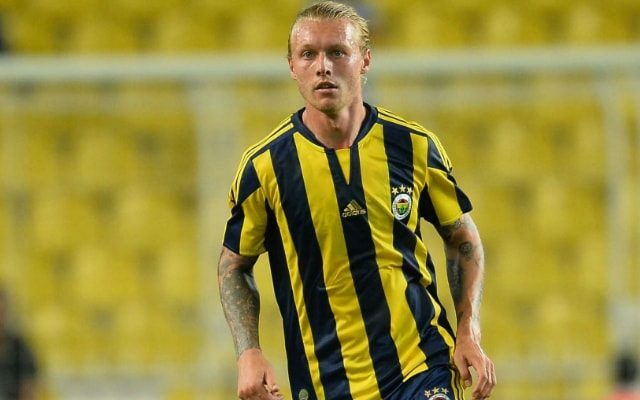 However, it doesn’t look as though Kjaer will be that player to fill the void as despite The Daily Star reporting on potential Chelsea and United interest, he has spoken to Turkish publication Fotospor and ruled out the move. “I have no intention of leaving Turkey, Turkish football has taught me a lot,” he said. It remains to be seen whether both Premier League giants now look elsewhere moving forward but evidently they are both keen to add another option in defence with Kjaer now set to remain in Turkey.